Welcome to the 511 BikeMapper Routing & Administration Application. This application provides advanced bicycle routing and turn-by-turn directions within all 9 SF Bay Area counties that MTC covers. In addition, with Administrative or Editor Login privileges, users are able to updated and edit both Bicycle Street Segment Routing Attribute data as well as Create and Edit the Geometry for Class 1 Off-Street Bicycle Paths not already in the database. To view the help documentation for the application click on the topic links in the panel to the left. What is the 511 BikeMapper? 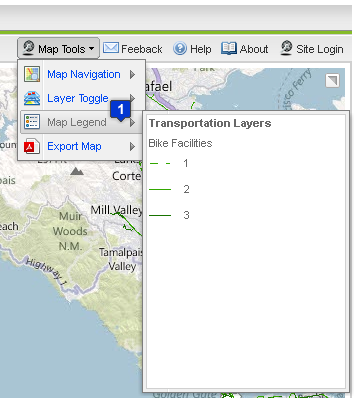 The 511 BikeMapper is an interactive mapping tool that displays all existing Class I, II and III bikeways in the 9 Counties that MTC covers (Alameda, Contra Costa, Marin, Napa, San Francisco, San Mateo, Santa Clara, Solano, & Sonoma). The 511 BikeMapper can determine the best route for your trip and provide turn-by-turn directions. This pilot project was funded by a grant from the Bay Area Air Quality Management District and developed in collaboration with the SF Department of the Environment and the SF Bicycle Coalition. Future development plans include expansion of the advanced routing functionality to the entire Bay Area. There are likely to be gaps in the bike network along your bike trip, so make sure to select your route carefully and obey all rules of the road. 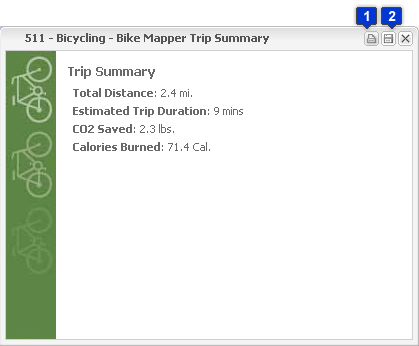 While the information in 511 BikeMapper is carefully screened, it may still contain some minor inaccuracies. Please email bikemapper@511.org with additions or corrections. What are Class I, II, & III Bikeways? Class I: Off-Street Shared-Use Path - A bikeway physically separated from motorized vehicular traffic by an open space or barrier. Pedestrians, skaters, wheelchair users, joggers, and other non-motorized users typically use shared-use paths. Class II: Bike Lane - Portion of the roadway that has been designated by striping, signing and pavement markings for the preferential or exclusive use of bicycles. Some cities and counties also define wide shoulders as bike lanes. Always ride about 4 feet from parked cars to avoid the door zone. Class III: On-Street Bike Route - Any road or street designated for bicycle travel. These routes are not for the exclusive use of cyclists. Often, routes include residential streets with low auto volumes and speeds. The regional 511 BikeMapper currently covers the nine SF Bay Area counties: Alameda, Contra Costa, Marin, Napa, San Francisco, San Mateo, Santa Clara, Solano, & Sonoma. It has been upgraded to include the routing functionality in this release of the application. MTC periodically collects bicycle facility data from cities and counties throughout the region. As new bikeways are added to the system, more cities and communities of the Bay Area come under the 511 BikeMapper coverage. Check back with 511.org periodically for updates to the Bay Area bikeways network. Where can I find more information on bicycling in the Bay Area? Information regarding the location of bicycle facilities, links to bicycle clubs and coalitions, links to county transit authorities and commissions, and where to find hard copy maps or Bike Buddies listings can be found on the www.511.org bicycle home page. Information about bikes and transit can be found on the 511 Transit Trip Planner page. To Begin planning your bicycle route, click the "Plan a Bike Trip" button in the upper left. You can then type your starting and ending addresses or you can click on the map to place your starting and ending locations. 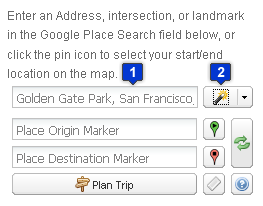 Enter the addresses including the city (e.g., 101 Market St, SF) in the Google Place Search text box, and use the Pull-down button next to it to set the location as your Origin or Destination. Click the Green Start Marker and click a starting location on map, then click the Red End Marker and click the ending location on the map. 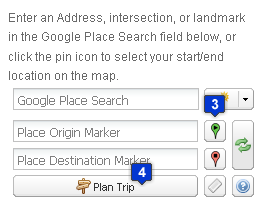 Click Plan Trip and your bike route will appear on the map. When the bike route appears on the map, a window with the trip summary is also presented. Click on the printer icon at the top right of the trip summary window to print the trip summary. Click on the disk icon at the top right of the trip summary window to e-mail the trip summary. Alternatively, you can click and drag on the map to pan the map. You can also use your mouse scroll wheel to zoom in and out. The Google Place Search textbox allows you to enter known addresses, zip codes, city or place names, landmarks, and business types in the search text box to locate these places on the map. Click the Google Place Search button. An orange marker will appear on the map for your result. 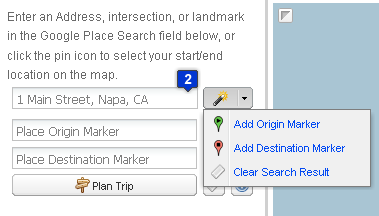 Right-click on the orange Marker to open a window which allows you to Move the Marker, Delete the Marker, Open the Marker info window, or set the Result Marker location as your trip start or end by clicking on the 'Add as Origin' or 'Add as Destination' links. To show the Google Street View panel, start by clicking the 'Plan a Bike Trip' button. To show Google Street View, click the small up arrow in the Lower Left Corner. To show Google Street View panoramic imagery, click and drag the orange person icon to the location you wish to view on the Google Street View Map. There are several layers that can optionally be viewed in the Administrative, Transportation, Demographic, and Environmental categories. To turn these layers on and off click the Toggle Layers Menu Item under the Map Tools Button on the Toolbar on the Upper Right side of the Map. Then, toggle the checkboxes for the layers you wish to view or not view. 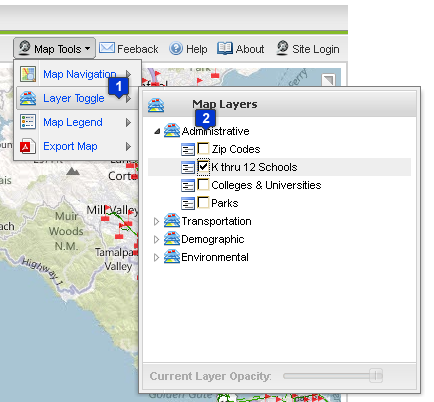 To view the Legend for the Map layers, click the Map Legend Menu Item under the Map Tools Button on the Toolbar on the Upper Right side of the Map. The Legend will appear on the side of the Map Legend Menu Item. There are several base maps that can be optionally viewed, such as the Google Terrain Map, Google Road Map, and Google Satellite Map. The base map default is the Google Terrain Map. To change the base map, click on the Map drop-down menu in the upper right corner of the map, then click on the base map you wish to use. 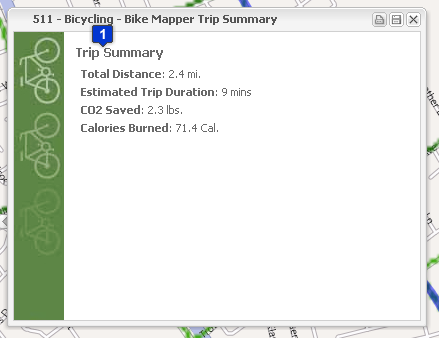 To clear bike routes and start/end location markers, click the Clear Markers Button next to the Plan Trip Button. Users can review the Street Network Inventory used for Bicycle Routing by selecting the Review Street Inventory tool found in the Edit Routes drop-down menu. This tool will allow users to select individual street segments by county, city and zip code, and then assign Bike Classification, Priority Ranking, and Status values accordingly. Using the Find Zip Code form, users must select a County, City, and Zip Code combination from the three pull-down menus to view and perform edits. Once the County, City, and Zip Codes have been selected, users must click the View Records form button to view the records. When the user selects an individual row in the results view, the Street Segment values can then be edited using the Street Segment Details form. Users are only allowed to change the Bike Class, Priority Ranking, and Status values. After making the appropriate edits/changes, click the Update Segment button to update the record in the database for that Street Segment and refresh the values in the results view. The user can also select an individual row in the results view and then update ALL Street Segments with the same 'Along Street' name, with the values selected in the Street Segment Details form for Bike Class, Priority Ranking, and/or Status. After selecting a record in the results view, make the changes in the Street Segment Details form, and then select the Update Street button to update ALL Street Segments in the database with that matching name and refresh the values in the results view. After a County, City, and Zip Code combination has been selected, users can at any time zoom the map to the selected Zip Code by clicking the View Zip Code button. Users also have the ability to zoom to individual street segments on the map by clicking the Locate Segment Button in the Street Segment Details form. 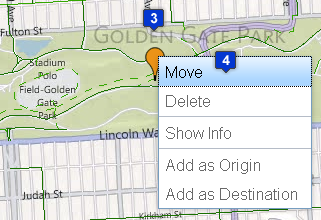 Users can edit values directly on the map using the Path Editing toolbar. This toolbar can be accessed via the Path Editing tool found in the Mapping Tools drop-down menu. 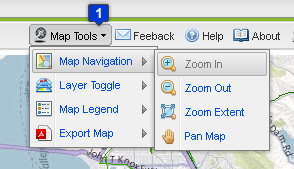 This toolbar contains two map tools, the On-Street Path Editor, and the Off-Street Path Editor. The Off-Street Path Editor will let users draw new Off-Street Shared Use paths (Class I routes), as well as edit and delete the geometry of existing Class I trails. The On-Street Path Editor will let users perform attribute edits on the Street Network Inventory by selecting individual street segments directly on the map. Prior to selecting this tool, users should navigate the map to an area of interest, and set the map zoom scale to level 15 or greater. The editing feature is only allowed at level 15 or higher. Users can then select the On-Street Path Editor button to find and select an individual Street Segment on the Map to display the Attribute Inspector window. This form will let users change the Bike Class value, the Priority Ranking value. and/or the Status value. Warning: While it is possible to select multiple street segments using this tool, we advise users to select individual street segments when performing attribute edits. If users do select multiple street segments, the save button will only update the values for the current record displayed in the Attribute Inspector. Users can navigate through the records by using the record navigation tool, update the values for each individual street segment in the selection array, and then close the Attribute Inspector. As with the On-Street Path Editor tool, users should navigate the map to an area of interest, and set the map zoom scale to level 15 or greater. When this tool is activated, the Class 1 Path Tools drop-down menu will be displayed. This pull down menu contains 3 Items: Draw, Delete, and Edit Vertices. The Draw Path tool will let users draw a new Class 1 Route on the Map. User must digitize each segment by clicking on the map at the desired location along the path. It is suggested that the new paths be digitized using either the ESRI Imagery, or the Google Imagery with Labels basemap. The digitize scale should also be set to Zoom Level 19 (The Maximum Allowed Zoom Level). Once the feature has been digitized, it is added to the database. The Delete Path Tool will let users select a Class 1 Route from the Map, and delete it from the database. Users are ONLY allowed to delete 1 selected segment at a time. The Edit Vertices Path Tool will let users select a Class 1 route from the Map and edit its geometry by moving its vertices. The Identify Bike Paths tool will let users identify Street Segments on the Map using a select box. The selected Street Segments are shown in the Panel on the Right side of the map. Results are displayed for both Class One Paths and Class II/III paths. The Clear Graphics tool will let users clear any Map Graphics that have been added to the map. 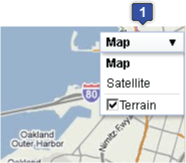 To change Base Map layers, click the "Map" pull-down menu in the upper right hand corner of the Map to show the list of available Base maps. This map service displays Bing Maps Aerial Imagery. 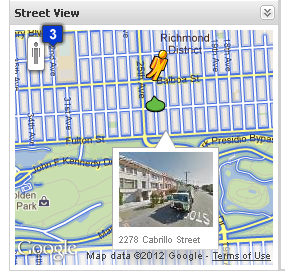 This map service displays Bing Maps Aerial Imagery w/ Labels. This map service displays the default road map view used by Bing Maps. This map presents low-resolution imagery for the world and high-resolution imagery for the United States and other areas around the world. This worldwide street map presents highway-level data for the world and street-level data for the United States. The Search Tool will let users enter local search criteria, such as an address, city, zip code, as well as a well known landmark. The map will then zoom to that location. Please tell us about your trip so that we can continue to provide tools to make bicycling easier in your community. Welcome to the Regional BikeMapper Administration Application. This tool will allow authorized users to update the bicycle route data for the nine-county bay area region using our street inventory database. The tool is intended to be used by County and City staff members who maintain bicycle route data in their respective jurisidictions. For any questions, please use Staff Contacts E-mail addresses below. Please enter the Email address you would like to send the Trip Summary and Directions to and then click the 'Send' button. Use this form to register a new account for the BikeMapper Administration Tool. Registerd users can update the bicycle route data for the nine-county bay area region using our street inventory database. The tool is intended to be used by County and City staff members who maintain bicycle route data in their respective jurisidictions. A member of the 511.org BikeMapper 3.1 BETA Technical team will contact you soon to finalize your registration. As a registered user, you will be able to edit data for the nine-county bay area region. Enter the Role Name and a Description of the Role. 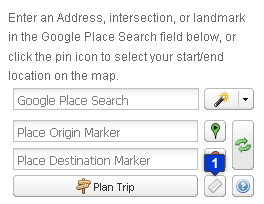 Enter an Address, intersection, or landmark in the Location Search field below, or click the pin icon to select your start/end location on the map. Bay Area Air Quality Management District. Please fill out this form in order to provide us with your feedback. If you have any questions, please feel free to contact Kearey Smith via email at ksmith@mtc.ca.gov. Thank you for your time, and assistance with the development of our new Bike Trip Planner web application.